I received an e-ARC of this manuscript via Netgalley in exchange for an honest review. Books set in bookshops always get put straight to the top of my to-be-read list, so when I heard about “Bookshop Girl” I couldn’t wait to read it. When the regional manager of Bennett’s bookshop comes for a meeting the staff are devastated to learn that their branch of the store will be closed. Sold to them as a fait accompli, they resign themselves to the idea- all except Paige Turner (don’t worry, the obvious jokes are addressed and it isn’t as cheesy as it seems!) and her best friend Holly who decide to become activists to prevent their only haven in their hometown from being closed. I’ve never worked in a bookshop myself, but I have experienced the soul crushing sadness of seeing yet another beloved bookshop disappear from the high street until the only place left to buy books is an hour away or online. I loved the friendship between Chloe and Holly and how silly they were together whilst also being supportive of each other. Their antics whilst attending their still life course were hilarious, and exactly how two sixteen year old girls would behave in such an awkward setting. There was some romance in this book, but it really took a back seat to the main plot which I think was really positive. The girls had their crushes but the bookshop and their friendship was far more important. Paige and Holly’s efforts to save the bookshop are so earnest and determined and their love for books is infectious. By the time I finished reading I was desperate to visit my nearest bookshop! 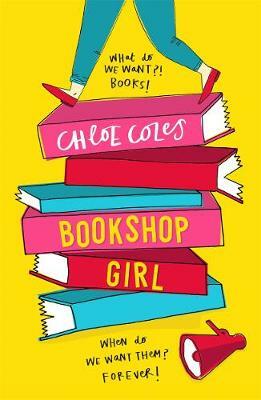 Bookshop Girl is a really fun, light, easy to read contemporary. The main characters are strong female leads and the whole message of the book is really positive. I’m looking forward to reading more in the series and continuing to get to know Paige and Holly.